The Casa Turrent Serie 1901 is a cigar made by A. Turrent Cigars. Hailing from Mexico, the Turrent family is best known for being a world renowned tobacco grower and many cigar manufacturers source tobacco from them. The Turrents are also known for making the popular Te-Amo brand. More recently in the U.S. market, they garnered attention with the release of the A. Turrent Triple Play Maduro and A. Turrent Puro Corojo. A. Turrent has worked with Altadis USA to handle its U.S. distribution of Te-Amo and the A. Turrent branded cigars. Recently the company announced it was discontinuing the A. Turrent lines and with the exception of Te-Amo decided to move its distribution in house. At the same time, the company decided to build a new brand called Casa Turrent. 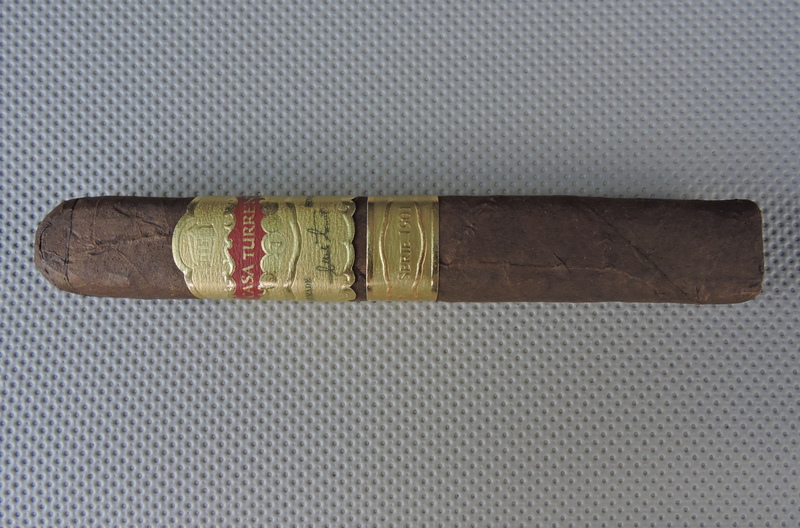 Today we take a look at one of those new brands, the Casa Turrent Serie 1901 in the Gran Robusto format. Overall, I found this to be an excellent offering and one definitely worth keeping an eye out for. Casa Turrent made its debut in 2013 when a maduro offering was featured at the Festival del Puro Mexicano. Following the festival, it became a house cigar at the A. Turrent’s Mexico City lounge. This was followed up by a limited release in Canada and select European markets. Last year, with distribution for the U.S. being handled by A. Turrent directly, the company decided to take Casa Turrent into the U.S. market. That original cigar was rebranded the Casa Turrent Serie 1901. Since then, A. Turrent has added two additional blends under the Casa Turrent brand, Casa Turrent Serie 1942 and the Casa Turrent Serie 1973 are being added. Today A. Turrent Cigars is run by Alejandro Turrent, a fifth generation cigar maker in the Turrent family.. The Serie 1901 pays homage to the year Turrent’s grandfather was born. Without further ado, let’s take a closer look at the Casa Turrent Serie 1901 Gran Robusto and see what his cigar brings to the table. The blend to the Casa Turrent Serie 1901 is a combination of Mexica and Nicaragua tobaccos. The cigar is highlighted by a Mexican San Andres Maduro wrapper. The cigars are made t Nueva Matacapa S.A. – a factory in Mexican owned by the Turrent family. Casa Turrent is available in three box-pressed sizes. . The Mexican San Andres wrapper of the Casa Turrent Serie 1901 Gran Robusto has a dark roasted coffee bean color. There is a light coating of oil on the wrapper. The surface of this wrapper had a slightly sandy texture, but this wasn’t a bumpy wrapper. There are also minimal veins and thin wrapper seams on the surface. Overall I found this to be a firm box-press with no soft spots. There are two bands on Casa Turrent Serie 1901. The primary band is mostly gold in color. On the center of the band is a irregular-shaped red colored field with the text “CASA TURRRENT” in gold font on it. Above that field is the Casa Turrent house logo embossed in gold. Below the red field are are series of gold medallions. The lower part of the band has the signature of Alejandro Turrent in gold font. To the upper left of that signature is the text “HAND MADE” in small black font while on the upper right side is the text “SINCE 1880” in black font. There is a secondary band that sits below the primary band which is also gold in color. On that band is the text “SERIE 1901” in gold embossed font. As I normally do, I started the cigar experience of the Casa Turrent Serie 1901 Gran Robusto by placing with a straight cut. After clipping the cap, I moved on to the pre-light draw. The dry draw delivered a combination of mocha (a mix of coffee and chocolate), espresso syrup (a thicker espresso note on the palate) and a slight woody note. Overall I considered the pre-light draw of the Serie 1901 Gran Robusto to be excellent. At this point I was ready to light up the cigar and see wha the smoking phase would have in store. The start to the Casa Turrent Serie 1901 Gran Robusto delivered a mix of mocha, cedar, and orange sweetness. Early on the mocha notes became primary and had more of a rich chocolate quality to it. The cedar and orange notes became secondary. Meanwhile, the retro-hale delivered a white pepper note. During the first third the rich chocolate profile remained the primary note. The orange notes made it into the forefront from time to time. The cedar notes remained in the background but I also picked up a slight white pepper note that lingered on the tongue. As the Casa Turrent Serie 1901 Gran Robusto moved through the second third, the mocha notes became less on the chocolate side and more on the roasted coffee side. The orange sweetness and cedar were grounded as secondary notes. Meanwhile the white pepper slowly began to increase. By the last third, I found the mocha notes had transitioned more to a classic roasted coffee note. The white pepper notes were now prominent in the forefront. There still was a touch of chocolate, orange, and cedar. This is the way the cigar experience came to a close. The resulting nub was cool in temperature and slightly soft to the touch. The burn of the Casa Turrent Serie 1901 Gran Robusto took a straight path from start to finish. There was a slight curvature on the burn line. This was easy remedied with some touch-ups and the amount of touch-ups was note excessive. The resulting ash was on the firm side with a medium to dark gray color. Meanwhile, the combustion to the Serie 1901 Gran Robusto was excellent as the cigar had an ideal burn rate and ideal burn temperature. The draw to the Casa Turrent Serie 1901 Gran Robusto was on the open side. Overall, I found this to be a low maintenance cigar to derive flavors from. In terms of strength, I didn’t find the Casa Turrent Serie 1901 Gran Robusto to be a nicotine bomb. I found the strength level to be medium from start to finish – without much variance along the way. Meanwhile the flavors of the Serie 1901 Gran Robusto started on the upper end of medium. By the time the cigar reached the second third, I found the flavors got deeper and moved into medium to full territory – where it remained for the duration of the cigar experience. In terms of strength versus body, I found the body had the edge throughout the smoking experience. This is quite an impressive cigar for A. Turrent. Given when it comes to Mexican tobacco, nobody probably knows more about it than the Turrents, so it was no surprise that this blend all came together. What particularly impressed me is how the San Andres Maduro wrapper did not overpower the blend, and you can taste some of the boldness of the Nicaraguan tobaccos. My gut tells me this is a blend that is even going to get better with some long term age. Overall this is a cigar I’d recommend to an experienced cigar enthusiast. This is also a nice cigar for a novice cigar enthusiast to graduate to something medium / medium plus. As for myself, this is a cigar I would reach for again – and it’s definitely worthy of a box split. I just tried this cigar the other day and found it to be delicious. I like the chocolate flavor. It goes great with a bottle of red wine.